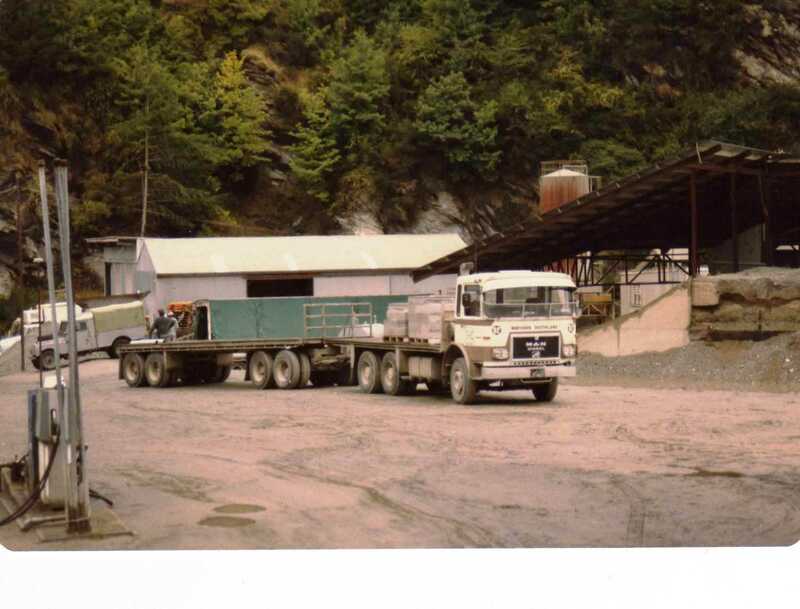 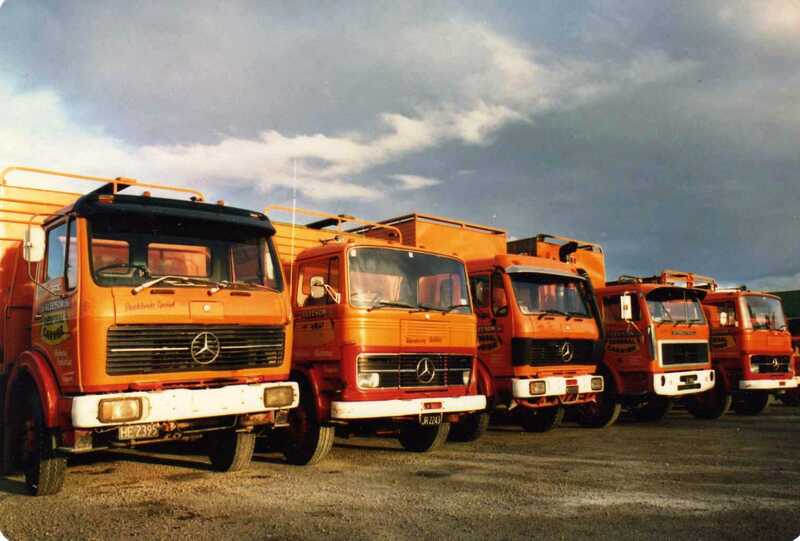 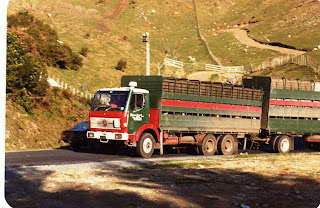 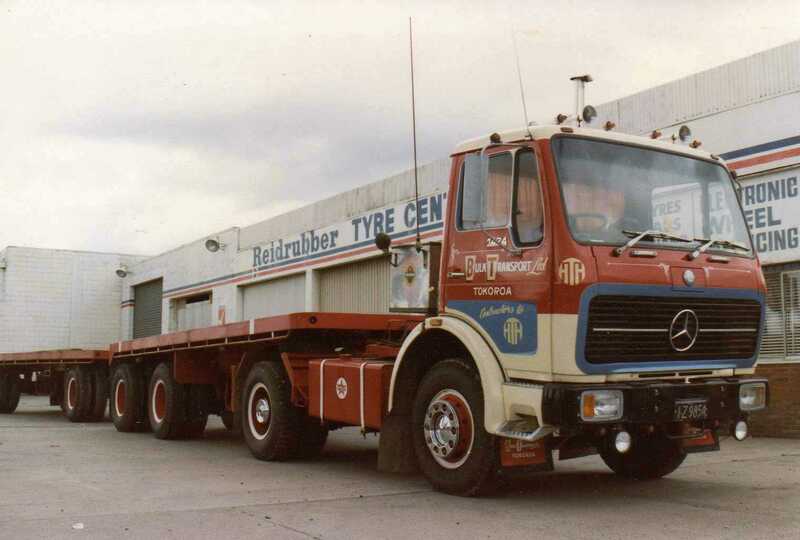 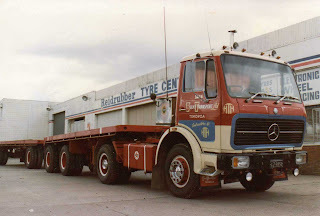 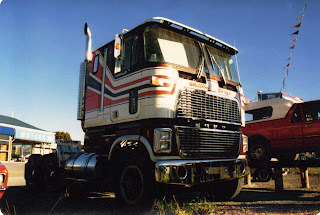 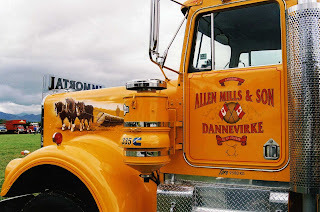 The first European trucks in NZ probably began appearing in the 1960s with a few Mercedes-Benz coming into the country, but it wasn't till the 70s that other European truck makes began arriving. 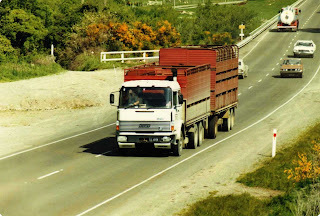 Most of the following photos were snapped in the 1980s. 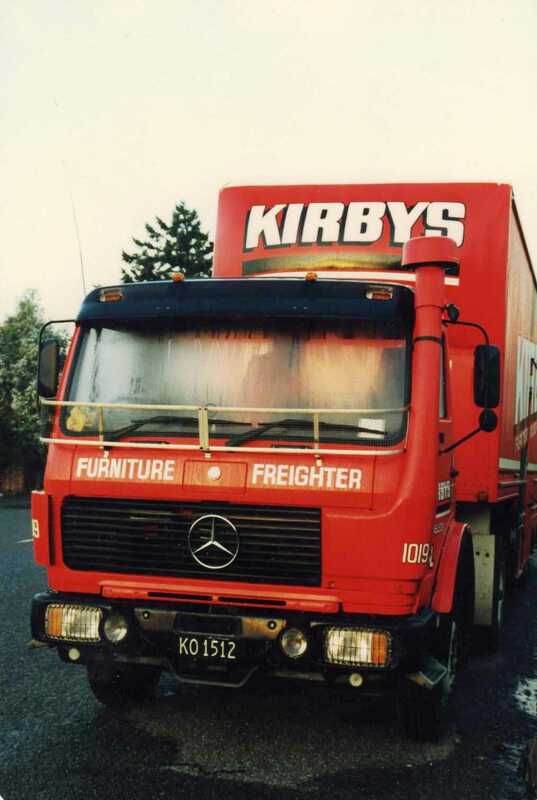 This Kirbys of Nelson Mercedes with furniture trailer hasn't started its days work yet, as is evident by the heavy dew on the glass. 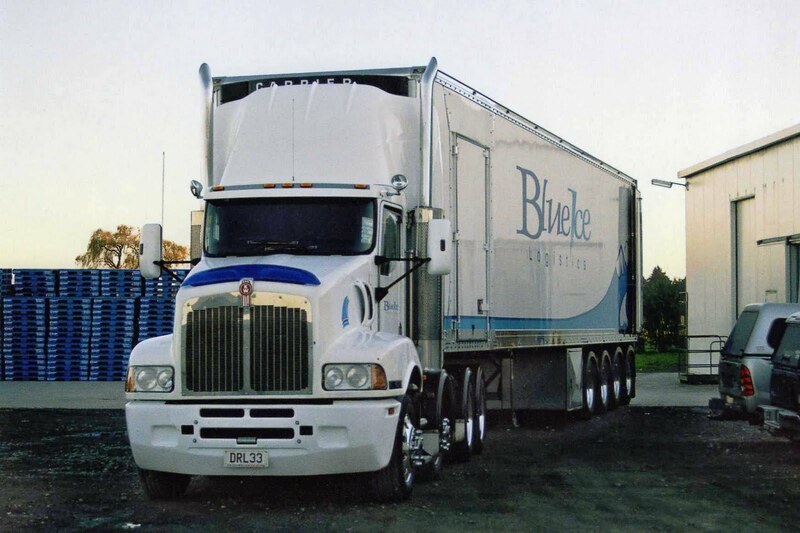 This unit has the optional high, front-mounted air intake, often specified for dusty climates. 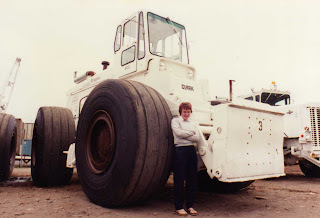 Kirbys became a part of the Transport Nelson group in 1970, thus giving Transport Nelson an entry into the world of furniture removal which was a large proportion of Kirbys business. 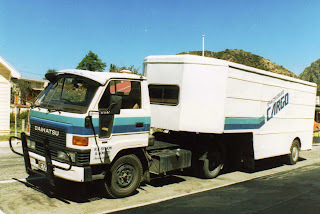 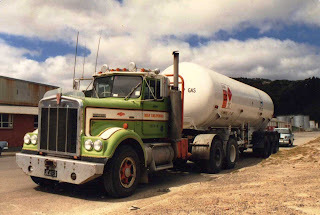 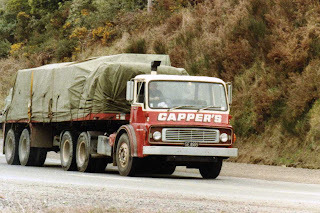 Lower Hutt's Neal Machirus had a few of these Australian sourced LK111 Scanias. LKs of course have the set forward front axle, which necessitates entry by climbing the steps behind the wheel then stepping forward to the door, similar to entering an American COE. 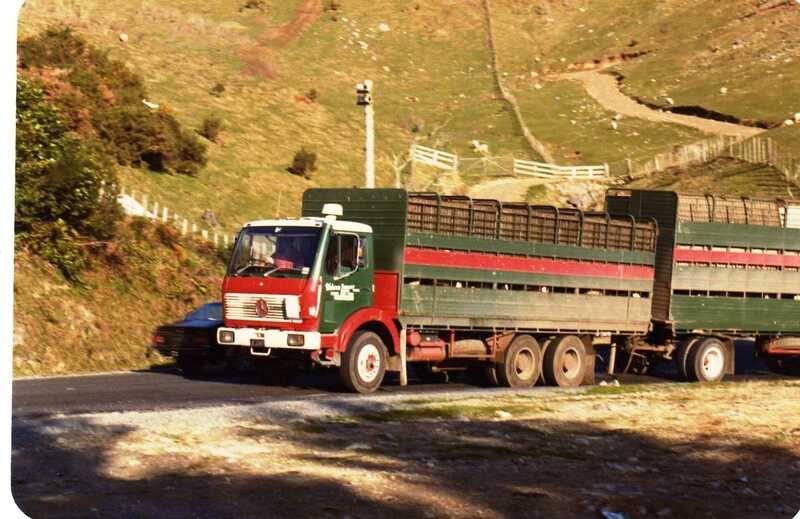 This V10 Mercedes-Benz 2232 stock truck climbs the road over the Kaimai Range. This Benz also has the front-mounted high air intake. 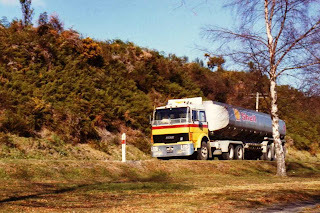 In Shell livery, is a 1982 Fiat 170 heading North along the Eastern shores of Lake Taupo. 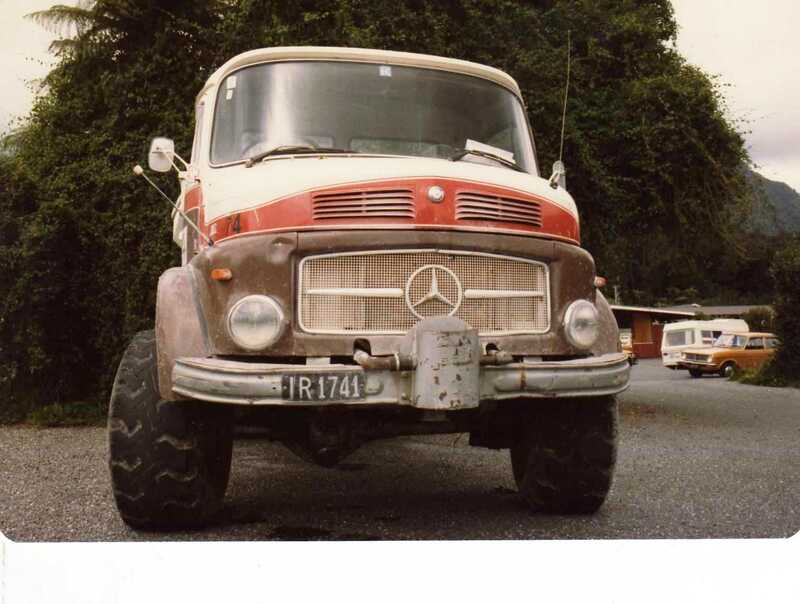 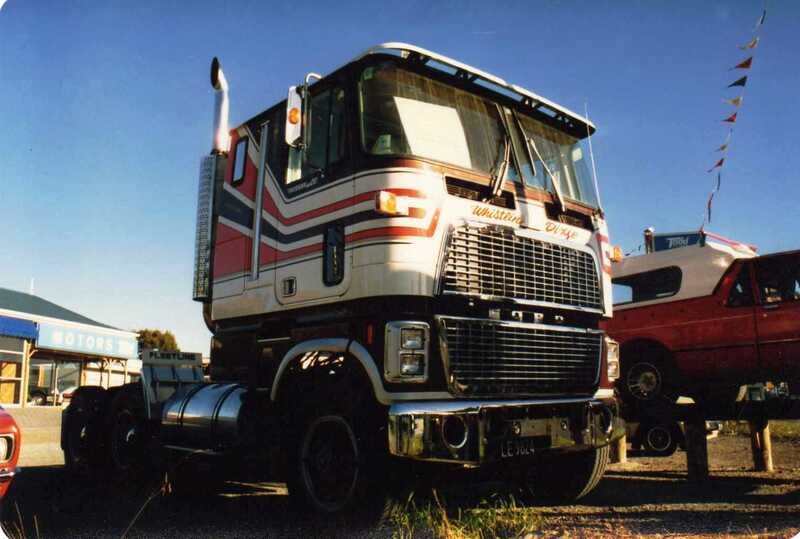 This smart 1978 Mercedes-Benz 1424 in day cab form is configured as an A-train. 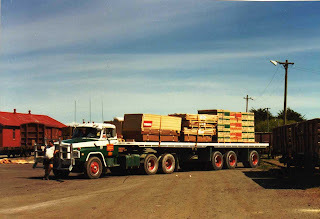 In Tokoroa, where this was snapped, those flat decks most probably cart cut timber. Gray Brothers of Greytown use their G88 Volvo (set forward front axle model) to move a shop to a new location. 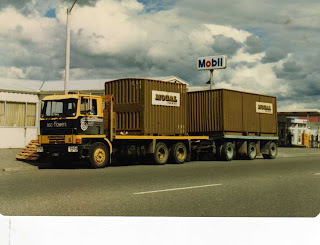 This picture in Pownall Street Masterton. 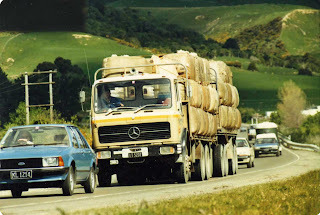 Northern Southland Transport are big user of German "breeds". 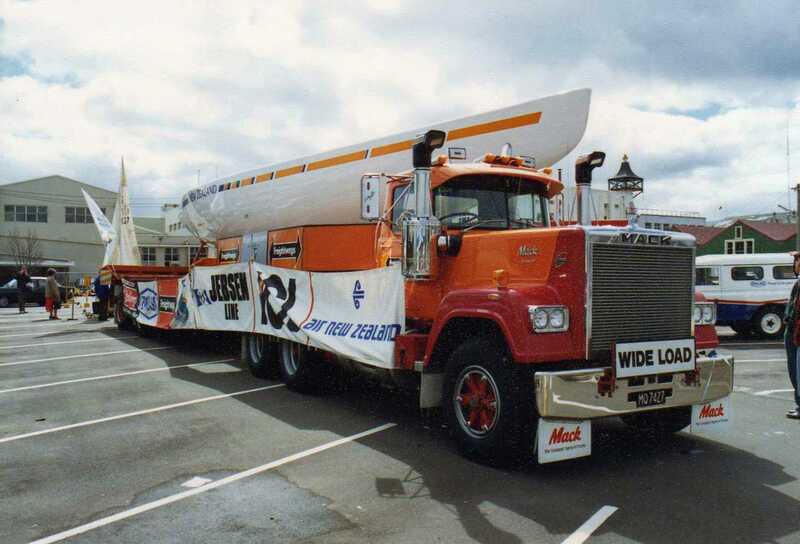 This 3 axle MAN with 4 axle drawbar trailer takes on a load of concrete building blocks in Queenstown. 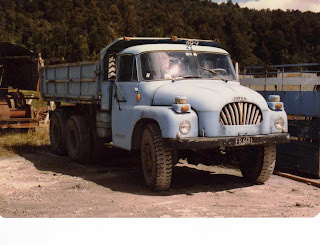 Tatras are not common in NZ, but a few arrived here in the 70s and 80s. Many of them were employed in off-road work. 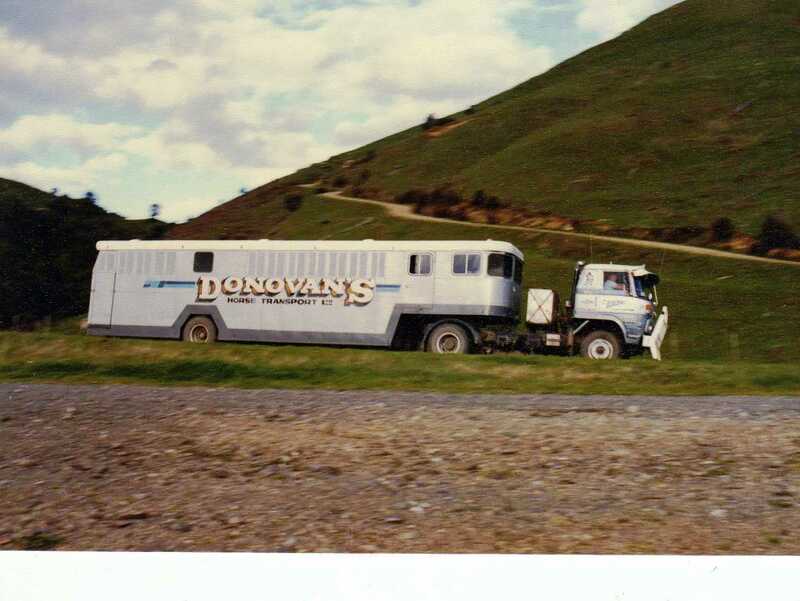 This one I spotted somewhere in rural South Island. 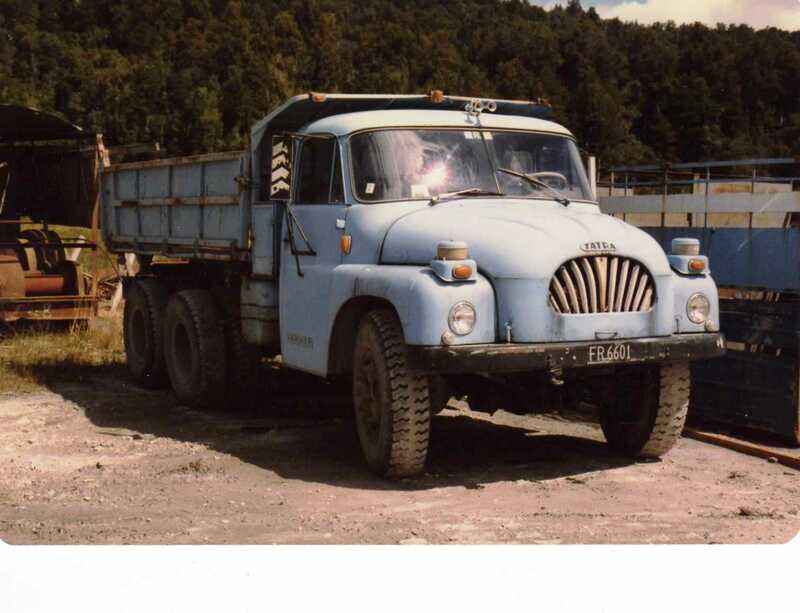 Tatras were unusual in having independent rear suspension with swing axles. 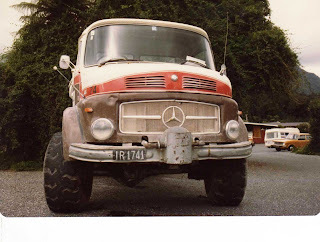 A 4 wheel drive Mercedes-Benz with wide tyres was rigged as a fertilizer spreader, parked at Fox Glacier. 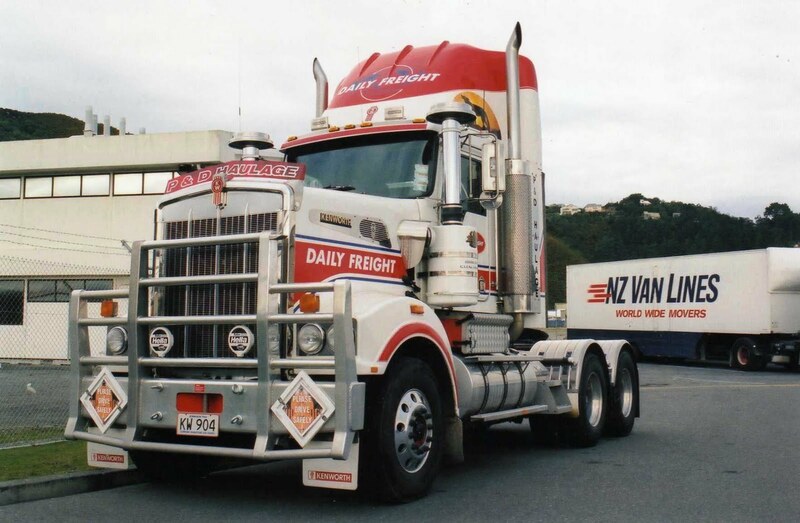 "There's an Aussie in our midst." 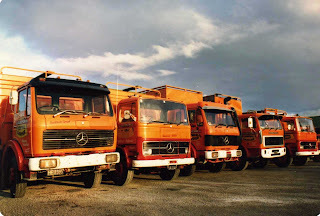 A lone International sits amongst the Mercedes-Benzs of the Gleeson fleet in Pahiatua. 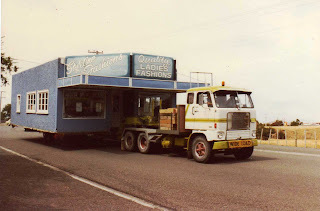 Eric Gleeson will be remembered for his passion for the German product and his scones that he regularly baked for his staff. 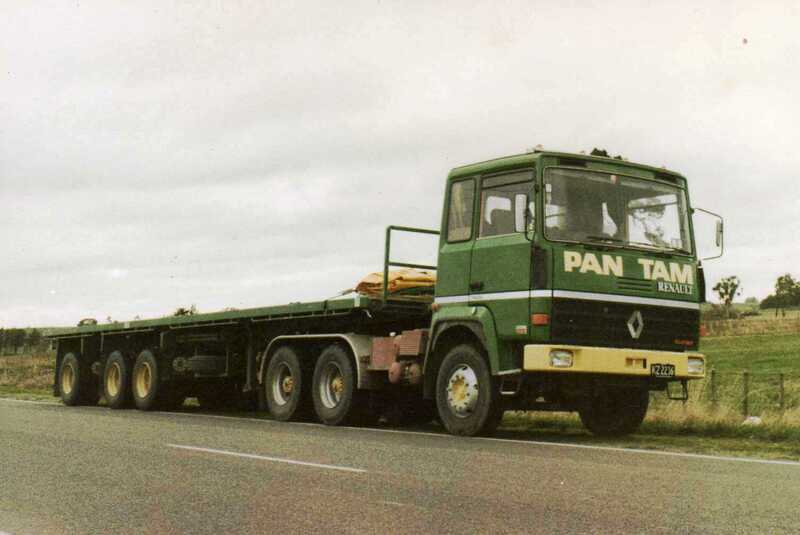 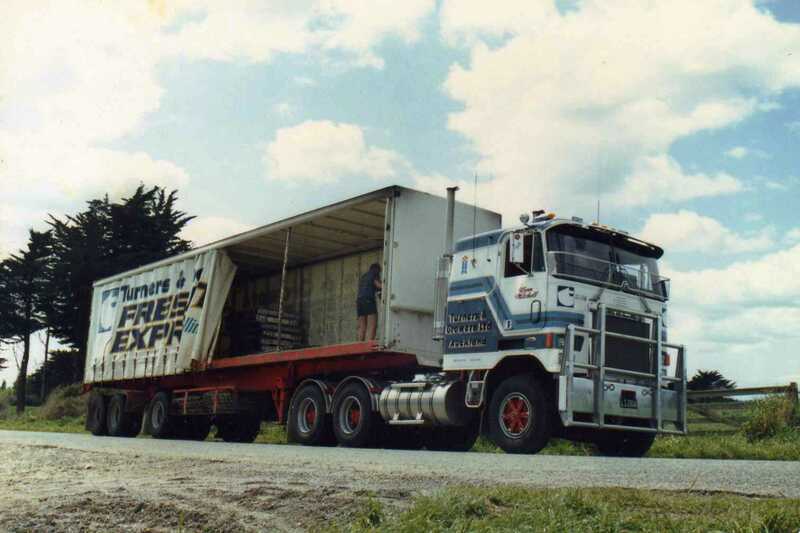 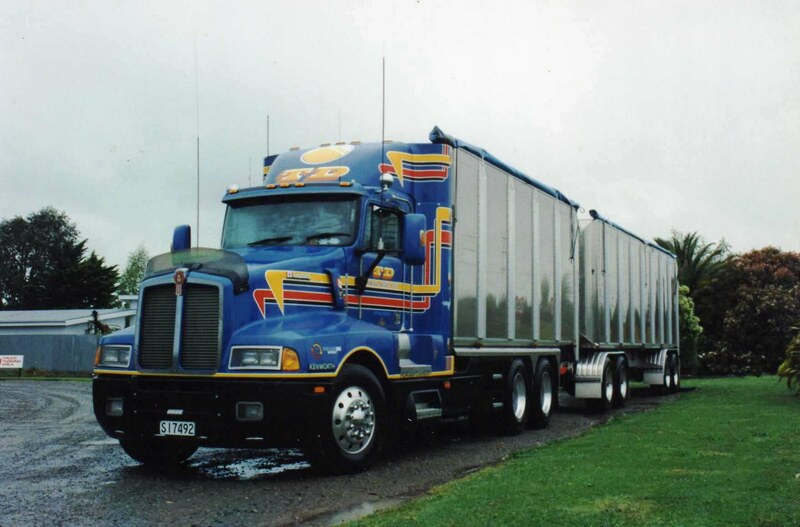 Renaults seemed to disappear as fast as they arrived on the NZ trucking scene. This one was parked at the side of State Highway 3, N.W. 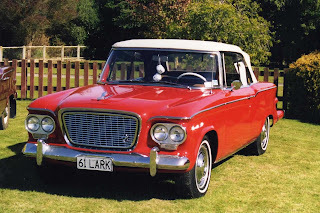 of Palmerston North. 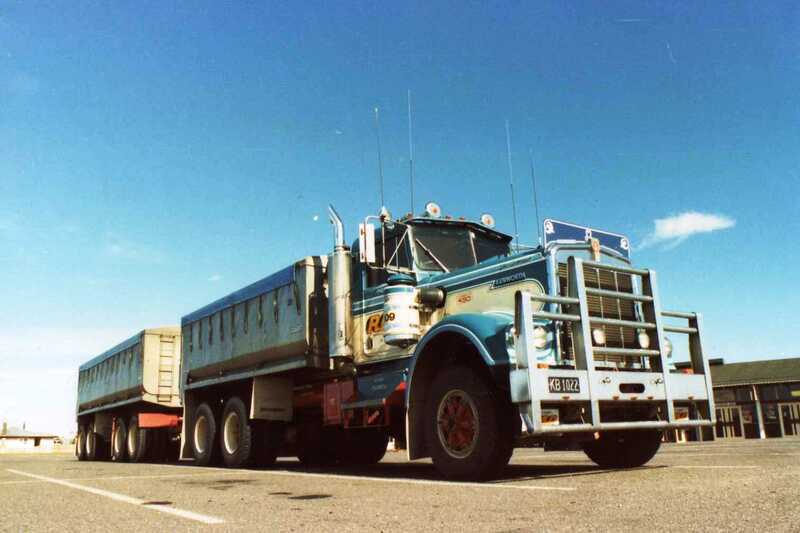 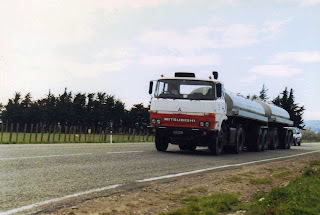 Smaller Scanias, like this LB80 from 1972, are not as common as the heavy duty models in NZ. 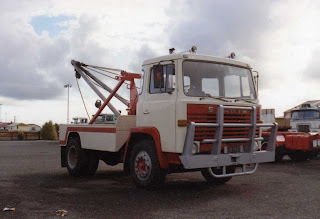 Even less common to see one as a tow truck. 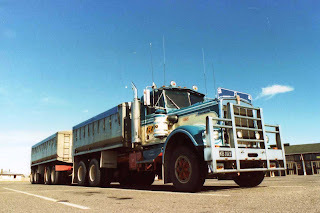 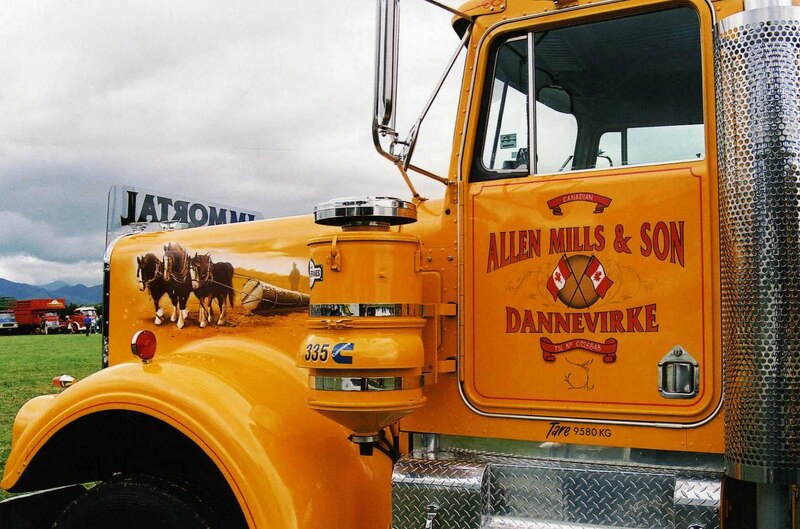 This superbly restored 1974 W924L was at the 2010 Vintage Harvest held in Carterton with some very nice artwork. 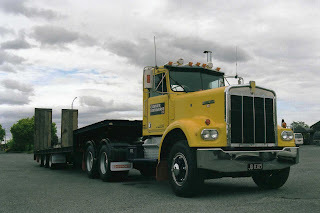 Also at the 2010 Vintage Harvest was this 1973 LW924R. 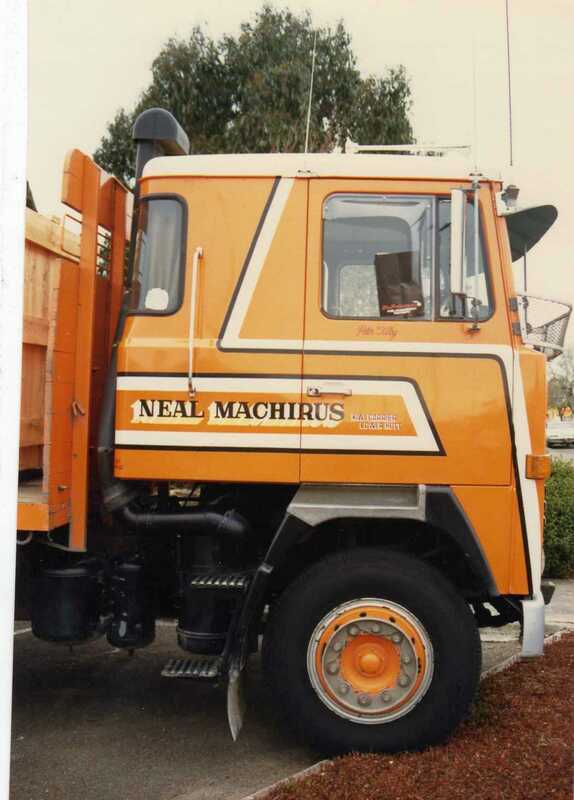 Clothier Earthworks of Mount Maunganui are still working this1979 W924, which is in amazing condition for a working truck of this age. Parked up for the night at Copthorne Solway Park Motor Inn in Masterton. 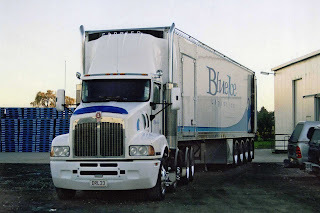 This 2007 T404S of Blue Ice Logistics is a 4-axle twin steer tractor pulling a 4-axle fridge trailer. 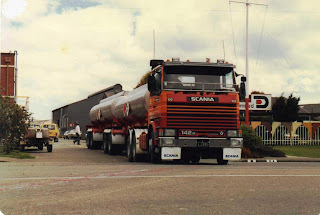 Here it is loading up with chilled products at Premier Bacon Co in Carterton. 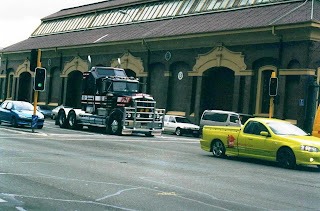 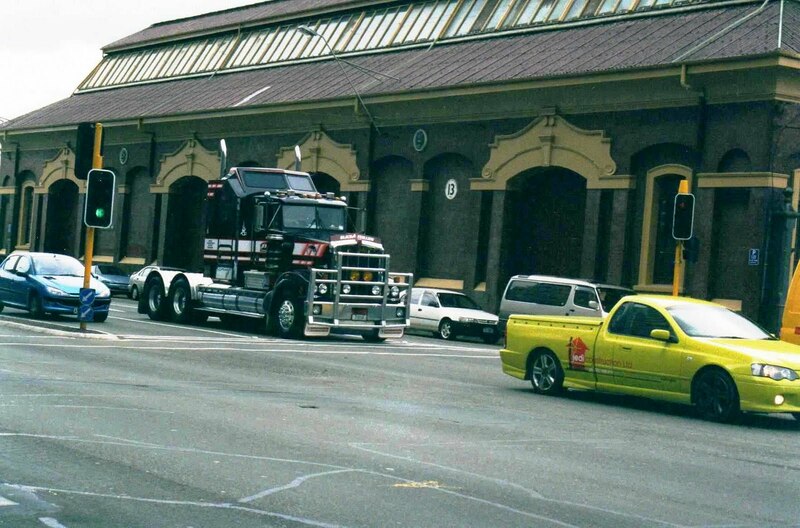 A 1993 kenworth T950 with narrow aerodyne style sleeper negotiates Wellington city traffic without trailer. 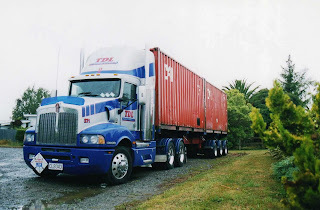 Transport Dynamics Ltd's 2004 model is parked with a load of two containers at Masterton Motor Lodge. 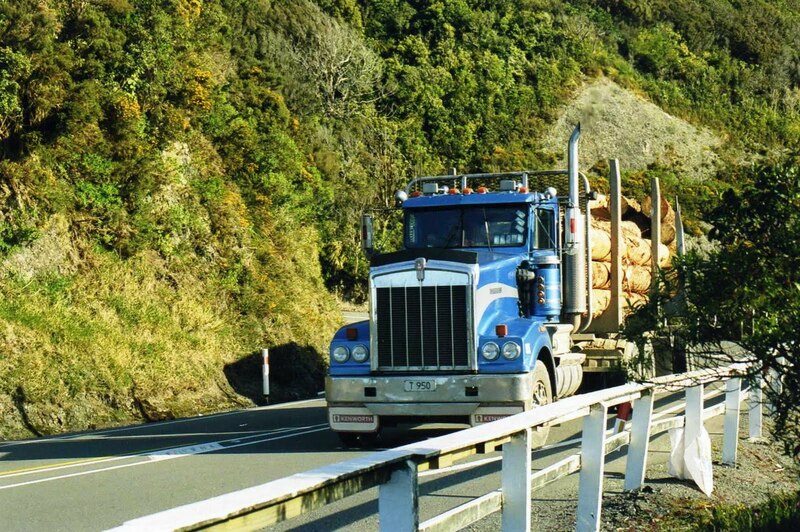 Rawhiti Earthmovers T950 operated in the lower North Islang for a short time on a logging contract. 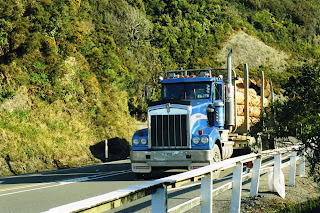 Here it pulls a load North approaching the summit of the Rimutaka Hill Road. 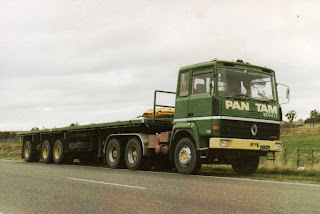 TD Haulage are long time KW users. 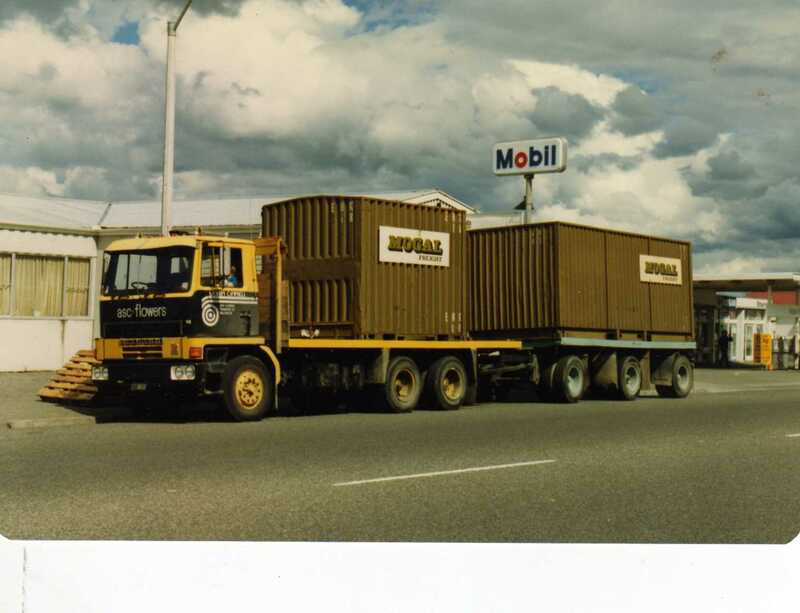 This 3 axle rigid with 4 axle trailer is at Masterton Motor Lodge. 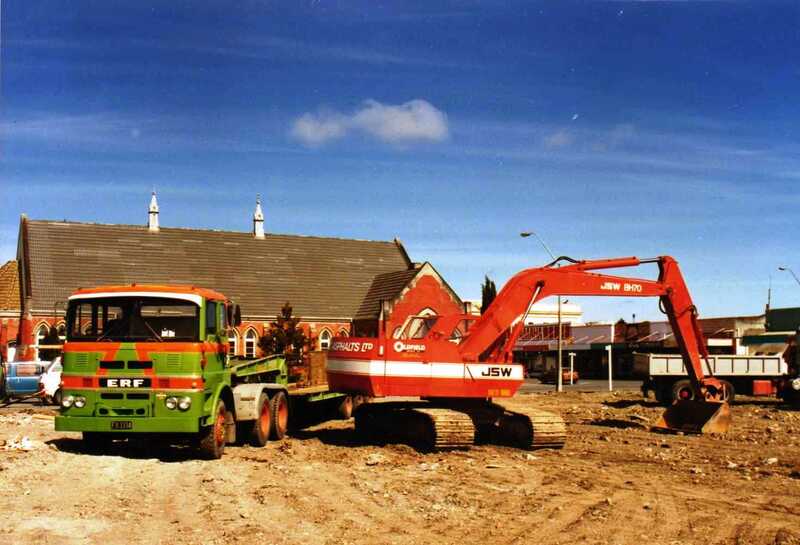 This T904 parked at Seaview is operated by P & D Haulage in the Wellington area. 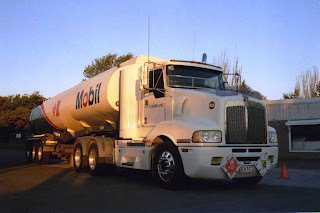 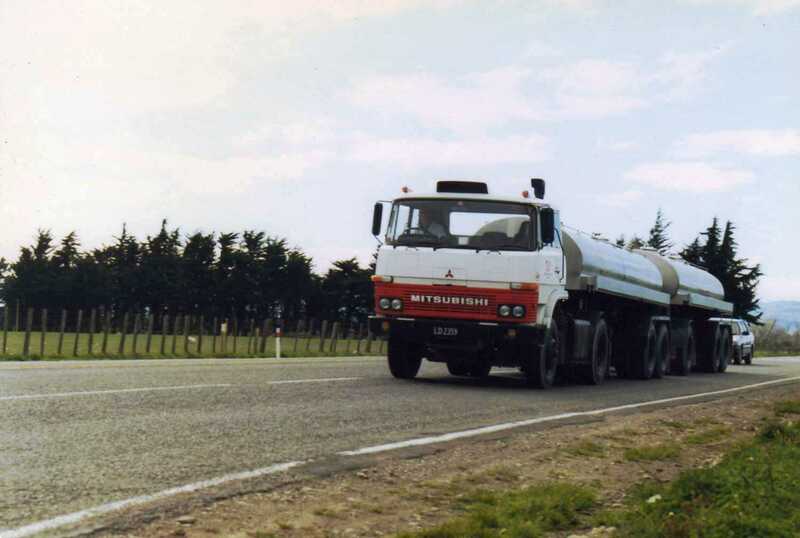 A Truck Rentals T401 pulls a fuel tanker for Kauriland, before they got Kenworths painted in their own colours. Rorison Mineral Developments operated an all KW fleet when this photo was taken at Copthorne Solway Park Motor Inn at Masterton.Nowadays some other brands have crept into their line-up. 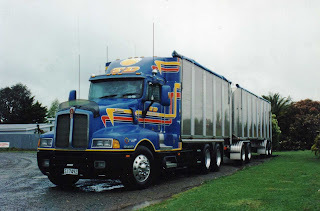 Mike Uhlenberg of Eltham was also a big KW user. 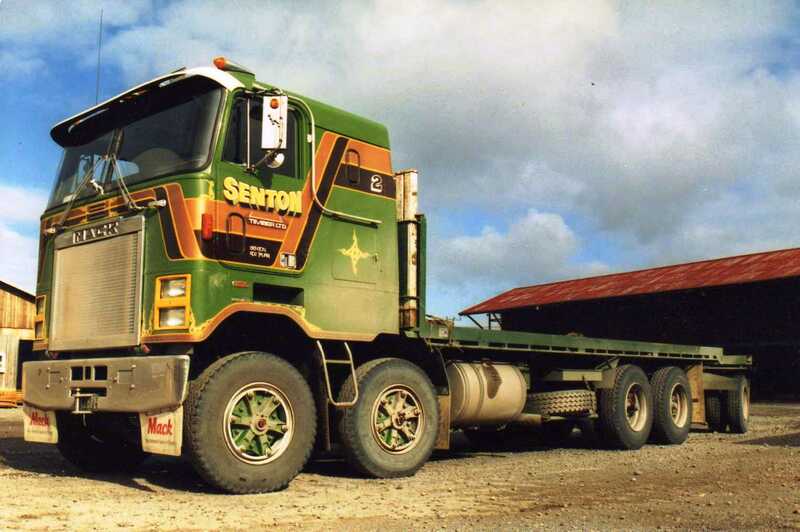 I'm not sure if he still runs any KWs, but he definitely has a large fleet of Peterbilts today. 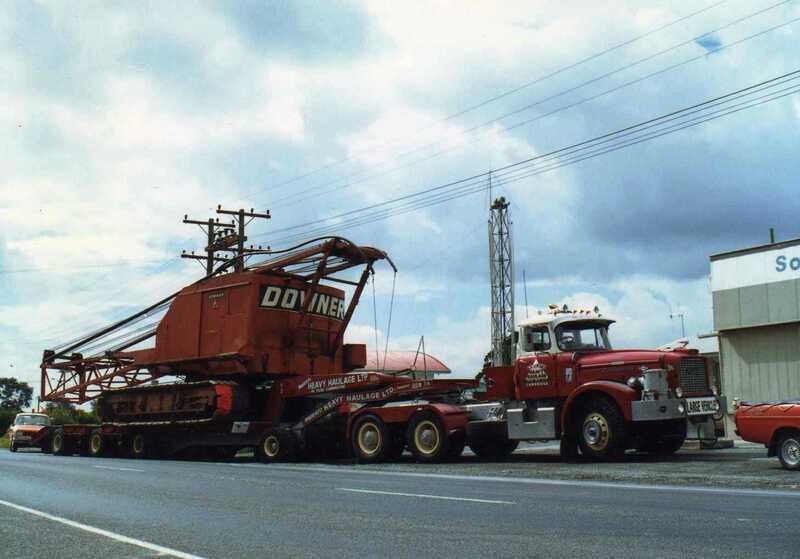 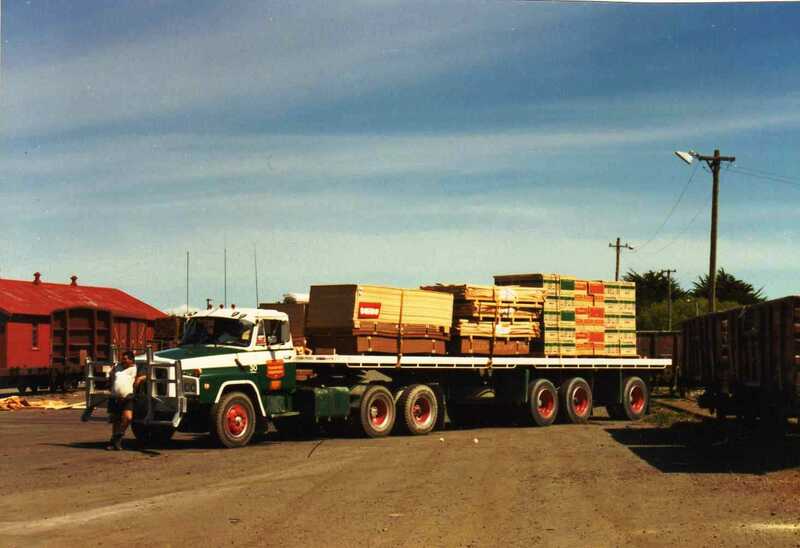 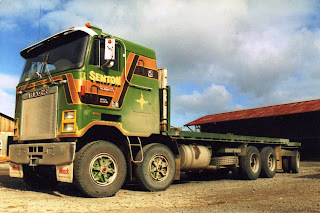 The O'Connor family of Masterton used to run a small fleet of stock trucks and other general freight luggers, but this KW , with extra axle installed ahead of the drive set, hauled logs in out of Rotorua. However, in this photo it is parked in their Lincoln Road yard in Masterton. 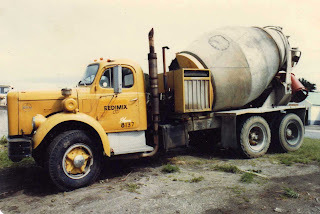 The O'Connors were real characters and I am told that one of them, in his younger days, would take a date to a dance....in his truck ! 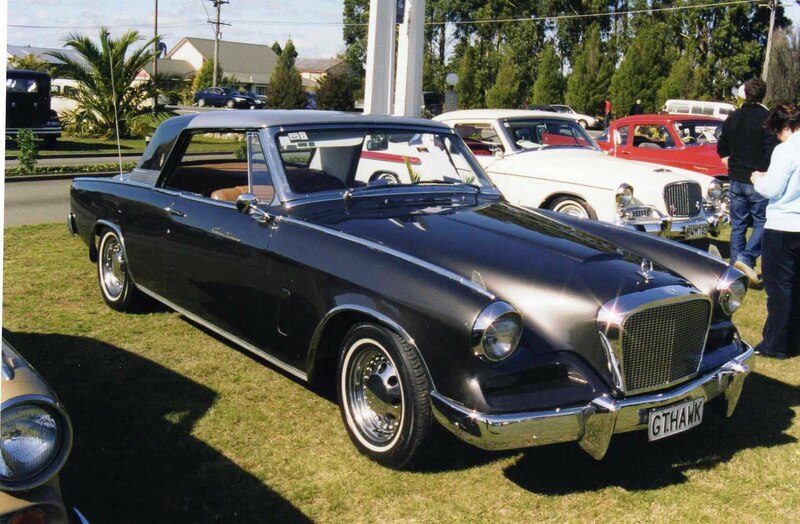 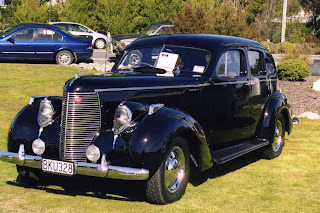 Over Easter 2006, Masterton hosted a gathering of Studebakers. 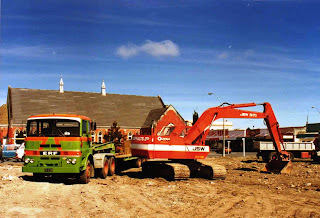 Unfortunately I had a fault in my camera at the time and many of the photos were under exposed. 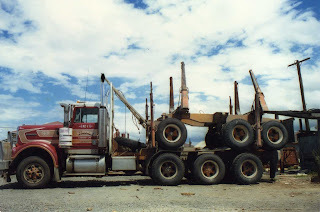 Here are some of those that did expose correctly. 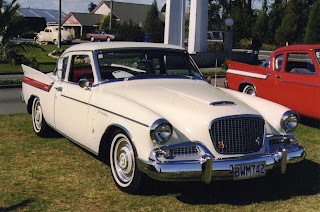 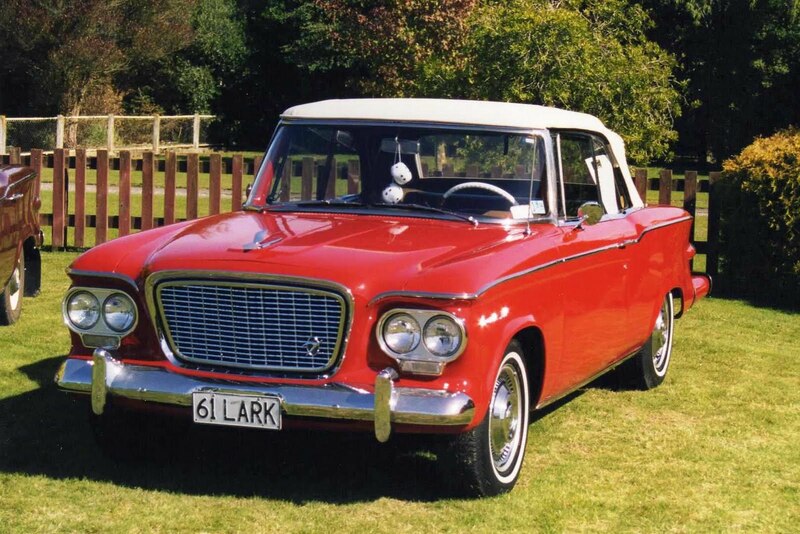 A 1961 Hawk with 289 ci V8. 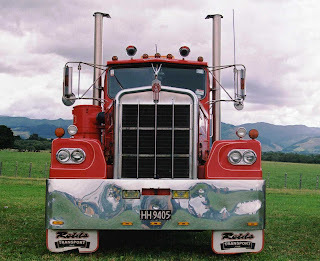 You can't paint a car gloss black unless the panels are dead straight. 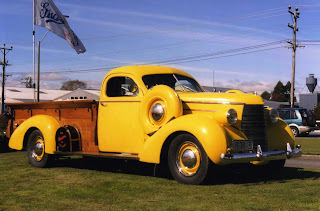 The photos don't do justice to this 1938 President.The doors were as good a mirror as the wheel covers, and the interior had been restored to a similar standard. 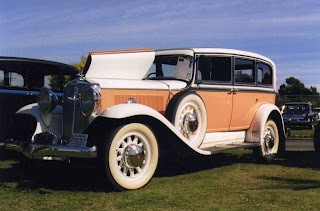 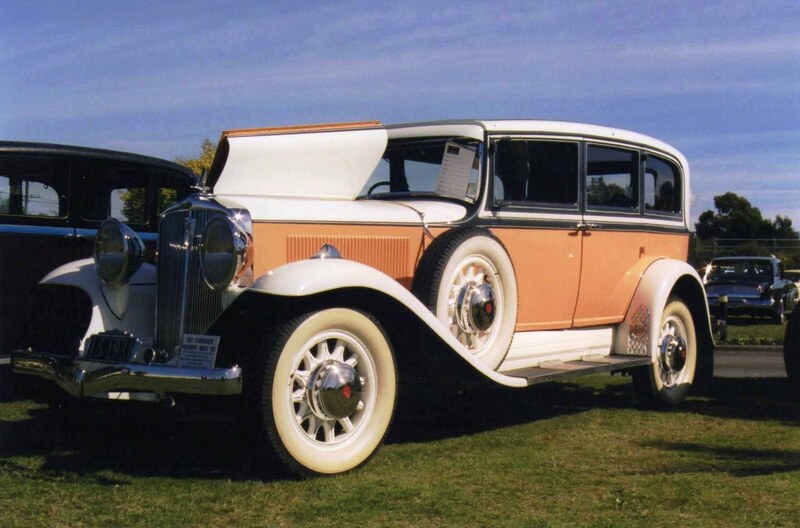 This is a 1931 President Model 90. 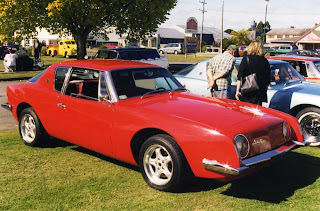 I would have liked to have taken the photo with the bonnet down, but couldn't find the owner and I didn't want to be caught touching it! A line up of Studebaker commercials. 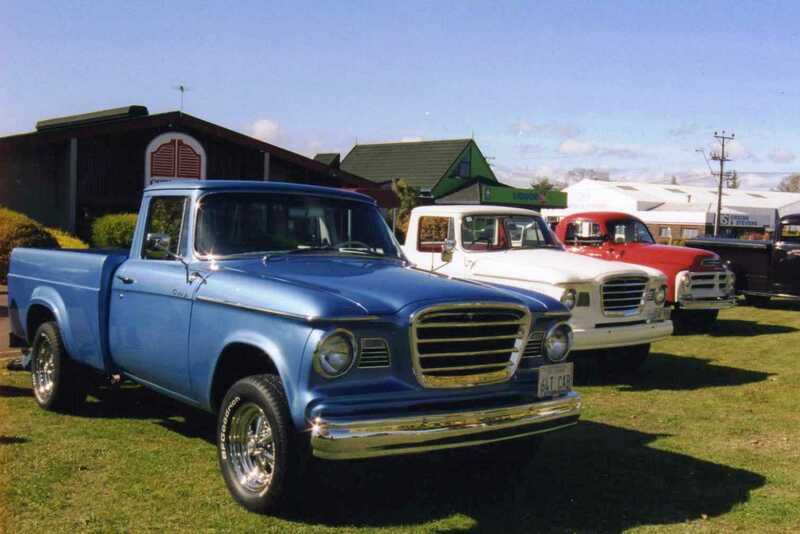 The one nearest the camera is a 1964 Champ. 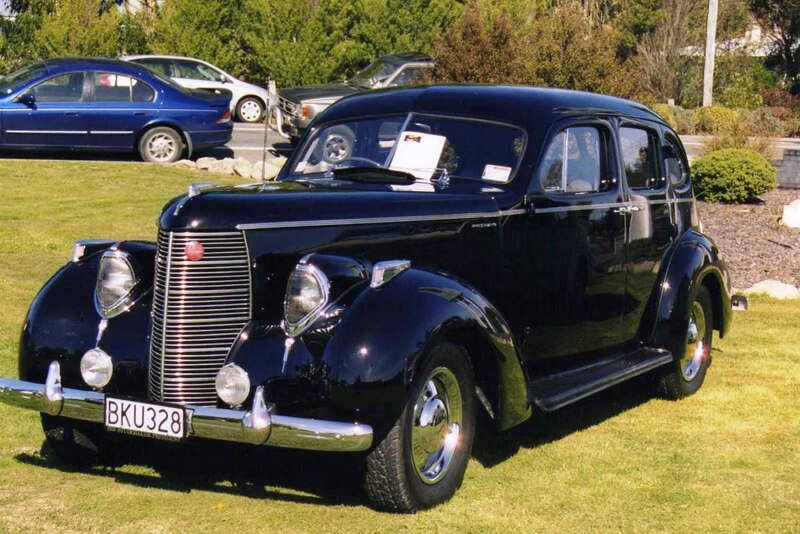 Another commercial, this time a 1938 Coupe Express. 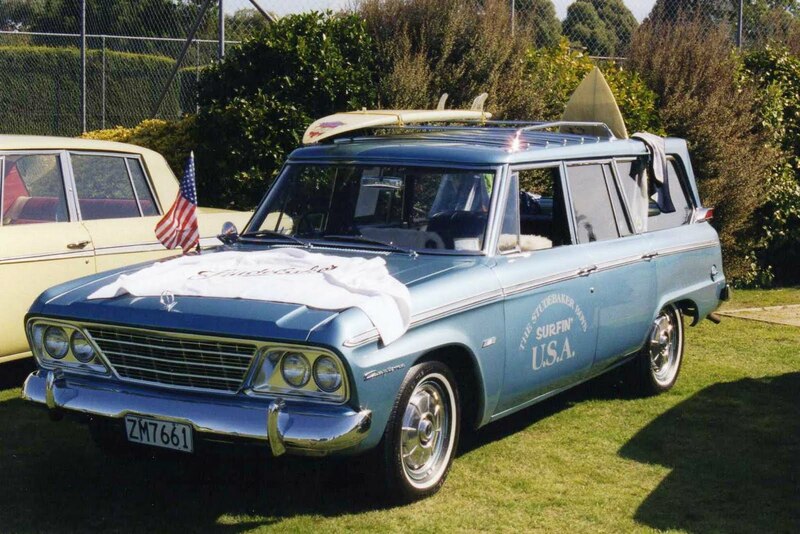 This 1965 Daytona with sliding load area roof was the ultimate surf wagon. Seen here decorated with surf-boards and beach towels, as well as the stars and stripes.